kz (pronounced "k-zet") (also known as RE:NDZ) is one of the early authors of Hatsune Miku songs, and most of his works have become hits, starting with his debut, "Packaged." He is skilled at creating reverberant, technopop pieces with Hatsune Miku. Though he has not been active on Nico Nico Douga since late 2008, he did create the new songs "Far Away" and "Star Story" for the release of the July 2009 Sony PSP game "Hatsune Miku -Project DIVA", and it's July 29, 2010 sequel "Hatsune Miku: Project DIVA 2nd". kz is the sole member of the amateur music circle livetune who, in late 2007, released an a Vocaloid album titled "Re:package" at Comic Market 73. It was then resold by Victor Entertainment with a major circulation release on August 28, 2008, making it the first Hatsune Miku CD to be sold by a major label. 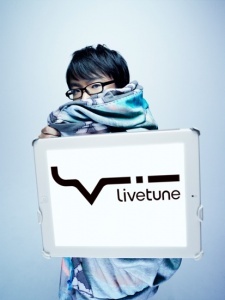 livetune was originally a 2 member unit, made up by kz and kajyuki. However, kajyuki left in 2008 to work at CAPCOM, leaving kz as the only member.